^ Bose، Sumantra (2009). Contested lands: Israel-Palestine, Kashmir, Bosnia, Cyprus, and Sri Lanka. Harvard University Press. p. 124. http://books.google.com/books?id=KKZcgOJPjVkC&pg=PA124. "After the official referendum the United States took the lead in sponsoring international recognition for Bosnia as a sovereign state, which was formalized in 6 April 1992. The Bosnian War began the same day." ^ Rogel، Carole (2004). The Breakup of Yugoslavia and Its Aftermath. Greenwood Publishing Group. pp. 59; Neither recognition nor UN membership, however, saved Bosnia from the JNA; the war there began on April 6.. http://books.google.com/books?id=vsy5IAsKJsYC&pg=PA59. ^ Walsh، Martha (2001). Women and Civil War: Impact, Organizations, and Action. Lynne Rienner Publishers. pp. 57; The Republic of Bosnia and Herzegovina was recognized by the European Union on 6 April. On the same date, Bosnian Serb nationalists began the siege of Sarajevo, and the Bosnian war began.. http://books.google.com/books?id=ZNKlZh3FwRUC&pg=PA57. 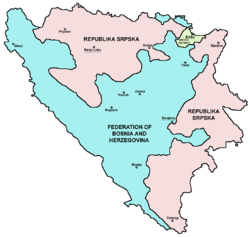 ^ "ICTY: Conflict between Bosnia and Herzegovina and the Federal Republic of Yugoslavia". http://hrw.org/reports/2004/ij/icty/2.htm#_Toc62882595۔ اخذ کردہ بتاریخ 25 April 2015. 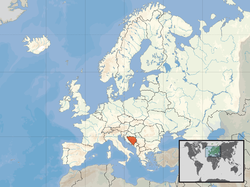 ^ "ICTY: Conflict between Bosnia and Croatia". http://hrw.org/reports/2004/ij/icty/2.htm#_Toc62882594. ^ "ICJ: The genocide case: Bosnia v. Serbia – See Part VI – Entities involved in the events 235–241" (PDF). http://www.icj-cij.org/docket/files/91/13685.pdf۔ اخذ کردہ بتاریخ 25 April 2015. ^ "Preliminary Results of the 2013 Census of Population, Households and Dwellings in Bosnia and Herzegovina". Agency for Statistics of Bosnia and Herzegovina. 5 November 2013. http://www.bhas.ba/obavjestenja/Preliminarni_rezultati_bos.pdf.